This summer, many newly graduated high school students will finalize preparations for the start of their college careers, from choosing a major and taking placement tests to securing their dorm rooms and buying textbooks. Also among those taking the next steps in their education will be transfer students. 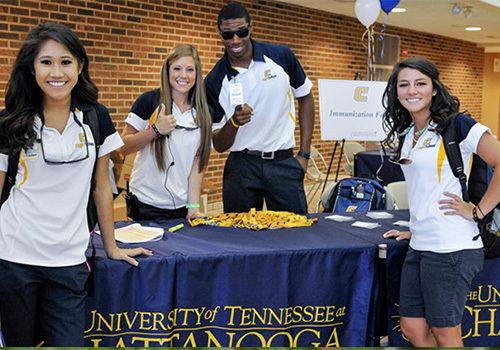 The University of Tennessee at Chattanooga (UTC) recognizes that these students face their own set of unique challenges and to help them navigate this transition, UTC recently became a participant in Tennessee Transfer Pathway program. The Tennessee Transfer Pathway program assists students currently working on associate degrees in selecting appropriate courses that will make their move to a four-year Tennessee university as seamless as possible. The web-based program is a collaborative initiative by the Tennessee Higher Education Committee, Tennessee Board of Regents, Tennessee Independent Colleges and Universities Association and the University of Tennessee system. While the website’s assistance does not eclipse the importance of seeking academic advising and support, UTC embraces the program as a steppingstone toward success on its campus and earning a baccalaureate degree. 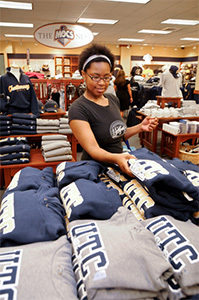 A student shops at the UTC Bookstore in Chattanooga, Tennessee. Upon acceptance into UTC, both transfer and freshmen students will find an academic community that is committed to supporting their personalized journey, both inside and outside of the classroom. For most, that journey begins at orientation. UTC hosts several multi-day orientations throughout the summer to help integrate new and transfer students into college life. Support from the Orientation Office has also contributed to the bookstore’s tremendous success with launching Barnes & Noble College’s Igniting the New Student Connection last year. The loyalty program is designed to connect and build relationships with incoming students from the moment they receive their acceptance letters and throughout their first semester experience. The program includes email, social media and exclusive student events and promotions.